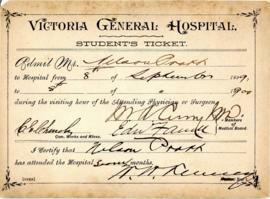 3 cm of textual records. 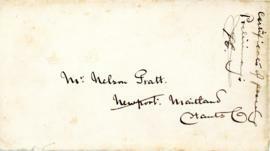 - 1 name plate. 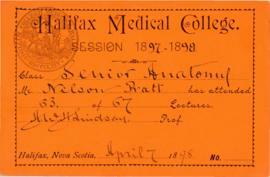 Fonds contains student tickets from Dalhousie University, Victoria General Hospital and Halifax Medical College; registration receipts; medical examination certificates; certificates of class attendance; certificates from the Provincial Medial Board; other letters and certificates certifying that Pratt completed certain parts of his medical training; and a plaque with Dr. Pratt's name on it. 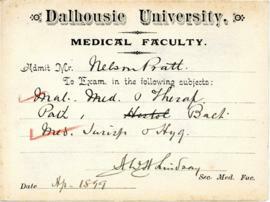 Preferred citation: [Identification of item], Nelson Pratt fonds, MS-13-32, Box [box number], Folder [folder number], Dalhousie University Archives, Halifax, Nova Scotia, Canada.